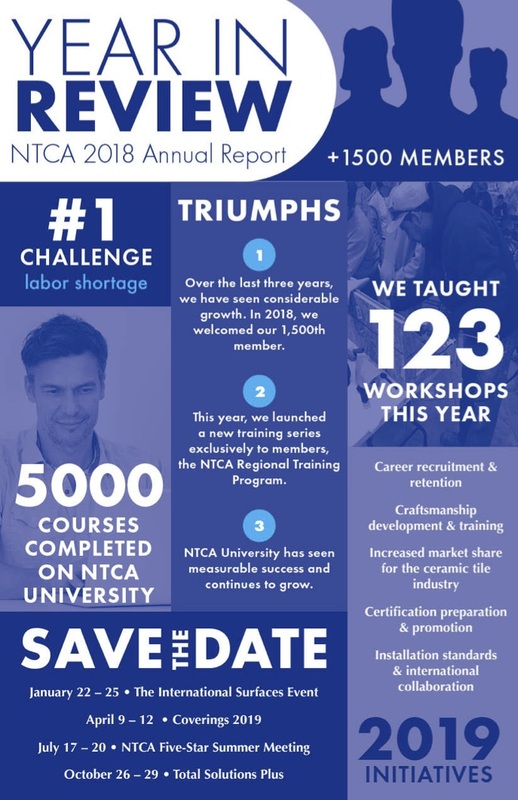 A private institution founded in 1701, Yale University resides on 315 urban acres in New Haven, Conn. Its graduate business programs are part of the Yale School of Management, and follow an integrated MBA curriculum in which students study “raw” cases and analyze a wide array of materials. 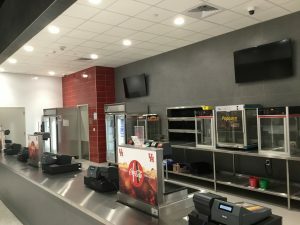 The English tiles from Royal Mosa, predominantly the 12” x 24” (30 x 61 cm) size, were installed in the lobby with Ultraflex LFT and grouted with Ultracolor Plus. The school conducts education and research in leadership, economics, operations management, marketing, entrepreneurship, organizational behavior, and other areas; at this time, its most acclaimed programs are finance, strategic management, and organizational behavior. 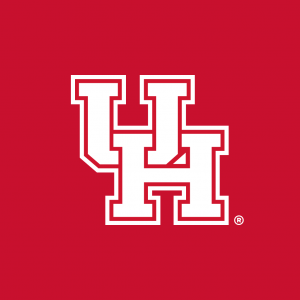 The school offers a wide range of graduate-level academic programs and concentrations, and is known for its finance faculty, emphasis on ethics, and International Center for Finance. In addition, the school has an Executive MBA degree program with opportunities for focused study in healthcare, asset management or sustainability. The school also offers student exchange programs with HEC Paris, IESE, the London School of Economics, and Tsinghua University. Mapeguard 2 was used in many of the large-format tile areas to protect it from cracking. Edward P. Evans Hall houses the Yale School of Management. The 242,000-sq.-ft. campus opened in January 2014. The building is situated at the northern end of the Yale University campus at 165 Whitney Avenue. The building was designed by Foster + Partners, Design Architect with Gruzen Samton, Architect of Record. 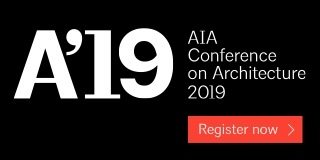 Foster + Partners is the prominent firm chaired by Pritzker Architecture Prize Laureate Lord Norman Foster (1962 graduate of Yale School of Architecture). Edward P. Evans Hall is home to state-of-the-art classrooms, faculty offices, academic centers, and student and meeting spaces organized around an enclosed courtyard. 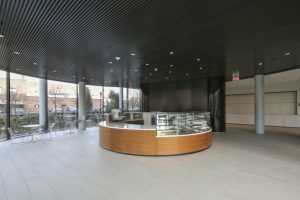 The design is intended to create a teaching and learning environment that will support the school’s integrated MBA curriculum and connect the Yale School of Management (SOM) community. 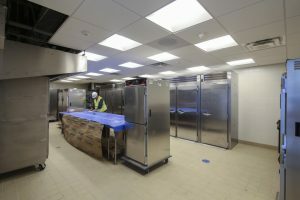 Atlantic Masonry does the majority of the tile installation work at Yale University, and they were called in to work with general contractor Dimeo Construction on this project. 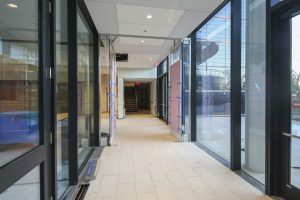 The crews installed quarry tile in the kitchens, porcelain tile from Daltile in the bathrooms, and a large-format English porcelain tile from Royal Mosa in the first-floor lobby surrounding the courtyard. 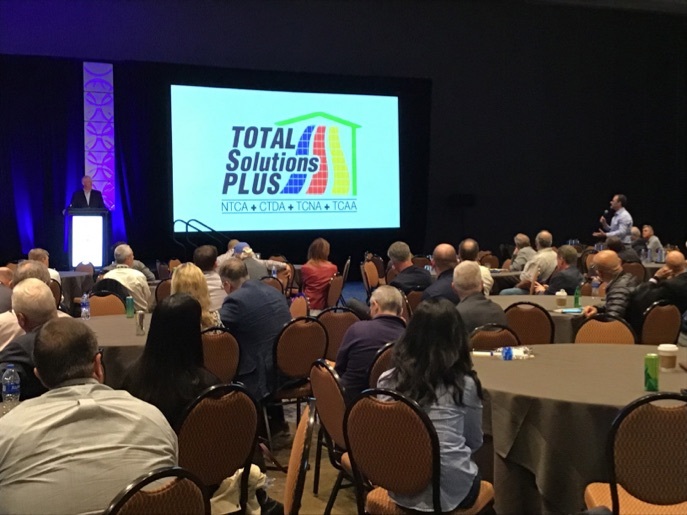 Ultraflex LFT, Ultracolor Plus with the Mapesil 100% silicone sealant were also used for the quarry tiles in the kitchens and the black-and-white porcelain tiles in the bathrooms. Various large-format tiles from England were used throughout this project. Mapeguard 2 was used in many of the large-format tile areas to protect it from cracking. Tile sizes include 24” x 24” (61 x 61 cm), 18” x 18” (46 x 46 cm), 12” x 18” (30 x 46 cm) and 12” x 24” (30 x 61 cm). Smaller sizes were also used on walls and floors in the bathroom installations. 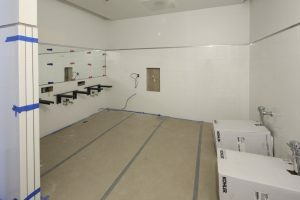 Atlantic Masonry does the majority of the tile installation work at Yale University, and they were called in to work with general contractor Dimeo Construction on this project. 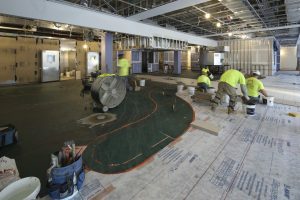 The crews installed quarry tile in the kitchens, porcelain tile from Daltile in the bathrooms, and a large-format English porcelain tile from Royal Mosa in the first-floor lobby surrounding the courtyard. Wall tiles in bathrooms were grouted with Keracolor U unsanded grout. The work began with the application of a pre-screed composed of sand and cement fortified with Planicrete AC. This mixture was used in a mud-set application to cover the tubing of an underfloor radiant-heating system. The most important aspect of this step was to ensure that the installers did not break any of the heating tubes; so, when the installers were pre-screeding, they continually tested the tubing to make sure nothing was damaged. Over top of the pre-screed, the Atlantic Masonry crews applied Mapeguard 2 premium crack-isolation and sound-reduction membrane to protect the large-format tiles from cracking – “issues that are becoming too common with the increase in tile dimensions in educational facilities, such as this Yale project, ” said Atlantic Masonry Project Manager Mike Coassin. Atlantic Masonry prefers Mapeguard 2 because it is thicker and denser than competitive products, and the installers think it does a better job in the long run. Over top of the pre-screed, the Atlantic Masonry crews applied Mapeguard 2 premium crack-isolation and sound-reduction membrane to protect the large-format tiles from cracking. 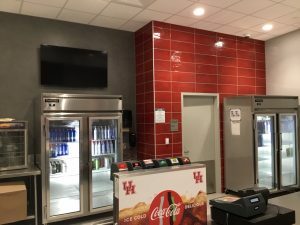 The English tiles from Royal Mosa, predominantly the 12” x 24” (30 x 61 cm) size, were installed in the lobby with Ultraflex LFT and grouted with Ultracolor Plus. 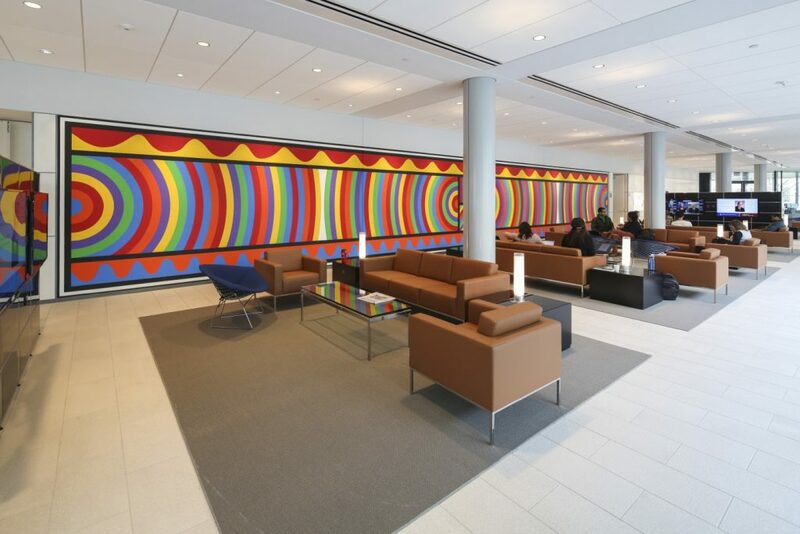 Mapesil 100% silicone sealant was used at the soft joints in the lobby – approximately every 15 to 20 ft. (4,57 to 6,10 m). These setting materials were also used for the quarry tiles in the kitchens and the black-and-white porcelain tiles in the bathrooms. The joints in the wall tiles of the bathrooms were grouted with Keracolor U unsanded grout. 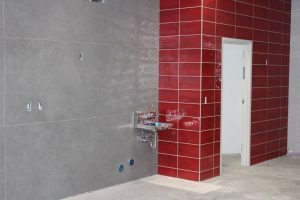 The bathrooms were also waterproofed with Mapelastic AquaDefense. 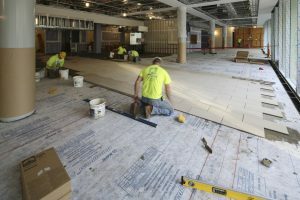 Atlantic Masonry Project Manager Mike Coassin said cracking issues are becoming too common with the increase in tile dimensions in educational facilities, like the Yale project. Mapeguard 2 was utilized to prevent this. 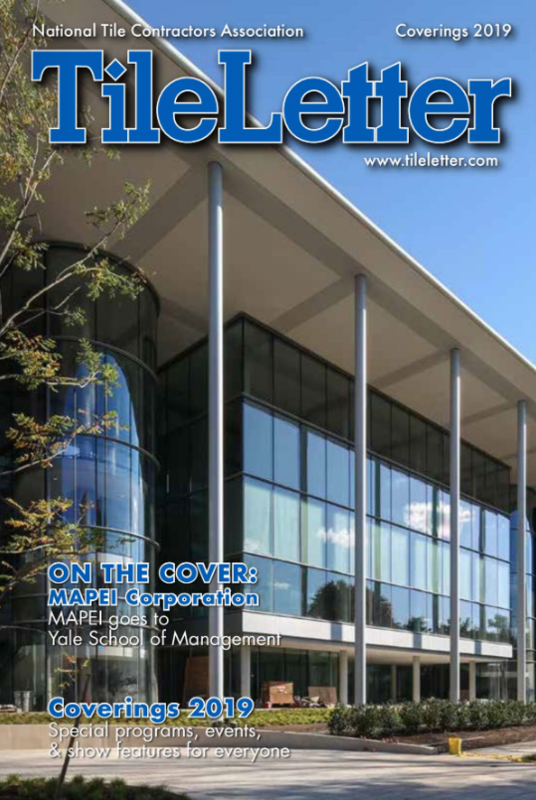 MAPEI Distributor: Daltile – North Haven, Conn.
Project Size: 51,000 sq. ft. 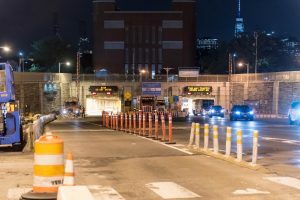 The Brooklyn–Battery Tunnel, officially known as the Hugh L. Carey Tunnel, is a toll road in New York City that crosses under the East River to connect the Borough of Manhattan with the Borough of Brooklyn. At 9,117 feet (2,779 m) in length, it is the longest continuous underwater vehicular tunnel in North America. The tunnel after the storm caused by Superstorm Sandy. Hugh L. Carey Tunnel officially opened in 1950 and consists of twin tubes, capable of carrying thousands of automobiles along four traffic lanes. In December 2010, the tunnel was officially named after former New York Governor Hugh L. Carey. On October 29, 2012, Superstorm Sandy made landfall on the East Coast of the United States – near Atlantic City, N.J. – with maximum winds of 80 miles per hour and driving rain. The Category 1 storm breached the seawalls in New Jersey and New York, causing massive flooding in streets, subways and tunnels. The Hugh L. Carey Tunnel itself was flooded with 60 million gallons (227 million liters) of salt water that needed to be removed from its two tubes. 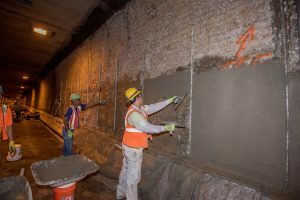 The damage done to the walls of the tunnel and the removal process required extensive repairs including 800,000 tile replacements and additional enhancements to prevent future disaster. Preparing the installation bed with MAPEI’s Modified Mortar Bed. 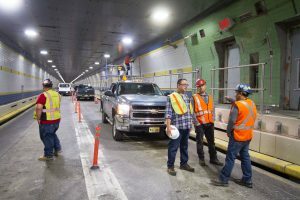 Gibraltar Contracting, the tile contractor on the Brooklyn-Battery Tunnel project, was asked to float a new mortar bed and install 400,000 sq. 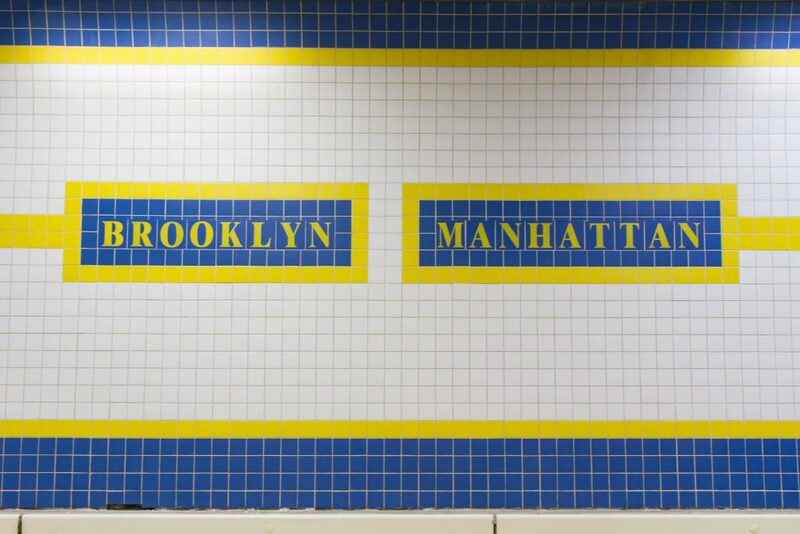 ft. (37 161 m2) of 6˝ x 6˝ (15 x 15 cm) Agrob Buchtal “Chroma” façade tiles across walls 15 feet high (4,57 m) of the 1.73 miles (2,78 km) of the Manhattan-to-Brooklyn side of the tunnel in the first phase of the restoration work. The Chroma tiles offer easier cleaning, as well as diffuse light for motorists. These tiles also act as a fire-retardant, providing a protective coating for the tunnel in the event of a fire. Installing tiles with MAPEI’s Ultraflex 3. The biggest challenge for the Gibraltar crew came in preparing the mud bed for the setting of the tiles. After the tunnel flooded, the removal of the original tiles left an extreme profile on the surface of the concrete walls. This profile had to be completely filled and leveled with a non-sagging mortar in order for the tiles to properly set. 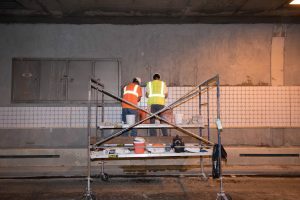 Further, engineers from the Triborough Bridge and Tunnel Authority (TBTA), operator of the Brooklyn-Battery Tunnel, required the most efficient system for reconstructing the tunnel and specified very stringent requirements for restoration of the walls and the application of new tiles. 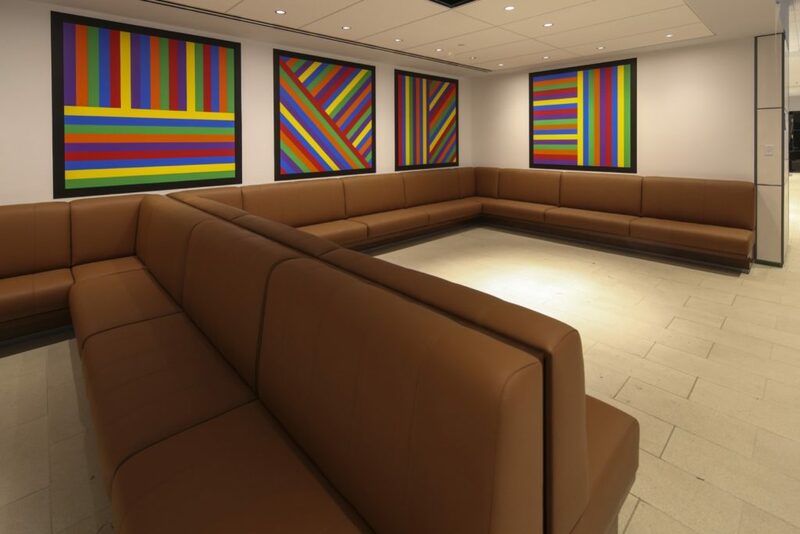 The Gibraltar crew turned to MAPEI tile installation products for the high-quality durability the job specified. View of the exterior entrances of the Hugh L. Carey Tunnel in New York. 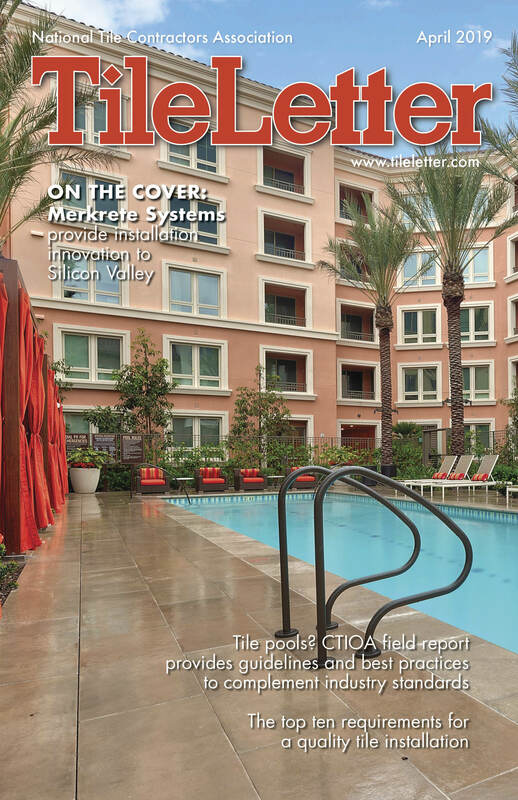 The Gibraltar Contracting crew applied two lifts (float coats) of MAPEI’s Modified Mortar Bed, a premixed, cement-based, polymer-modified, thick-bed and render mortar that includes a blend of select aggregates. 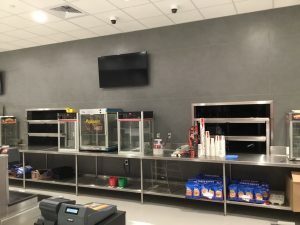 This was a great solution because, rather than requiring the use of a latex additive, Modified Mortar Bed only requires mixing with water to produce a high-performance bond. 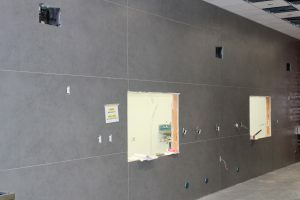 This mortar was applied to the damaged tunnel walls providing a smooth, curved substrate for the setting of the tiles. The maintenance access areas are designated with mint-green tiles. 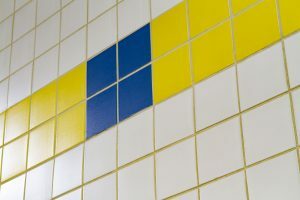 blue tiles with yellow accents. Around the tunnel’s periodic maintenance access areas, they installed mint-green tiles to make these areas easily visible. Regardless of color, all of the tiles were set with Ultraflex™ 3, the strongest mortar in MAPEI’s Ultraflex series. 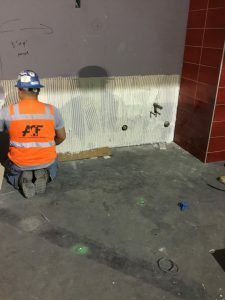 The crew then grouted all the joints with Ultracolor® Plus FA, MAPEI’s fine-aggregate, fast-setting, efflorescence-free grout. Ultracolor Plus FA’s built-in DropEffect™ technology reduces surface absorption, helping to repel water, dirt and grime from penetrating grout joints. The Chroma tiles grouted with Ultracolor Plus FA. tunnel was completed in March 2017. During the 2017-2018 timeframe, the Gibraltar crew repeated the entire process, heading through the other tube of the tunnel, from Brooklyn back to Manhattan. To ensure future protection from flooding, 44,600 pound bronze flood gates were also installed at either entrance of the tunnel. 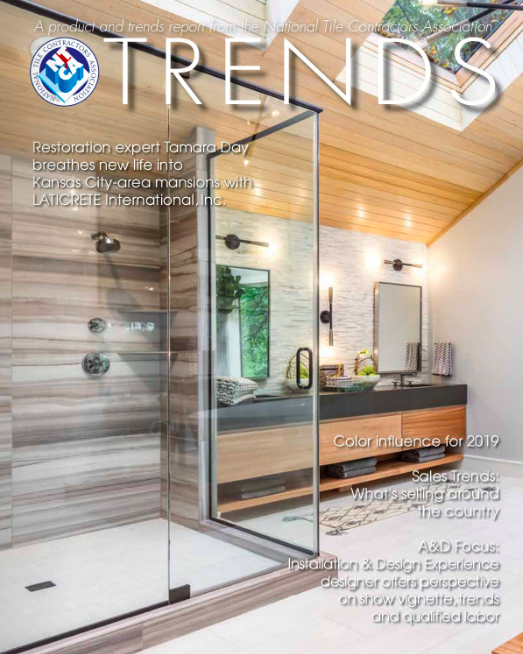 The 22˝ thick, 29´ x 14´ gates were made by Walz & Krenner, Inc., of Oxford, Connecticut, a marine-based-company specializing in the design and supply of custom watertight closures. 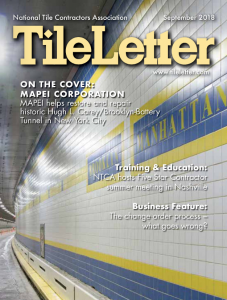 MAPEI was honored to help in the restoration of one of New York City’s most historic tunnels. *According to the Metropolitan Transportation Authority (MTA) website. 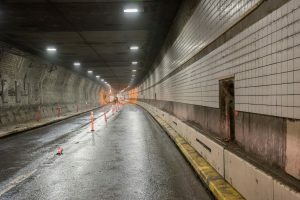 The Hugh L. Carey Tunnel is a 9,117-foot tunnel under the East River that connects Brooklyn to Manhattan.